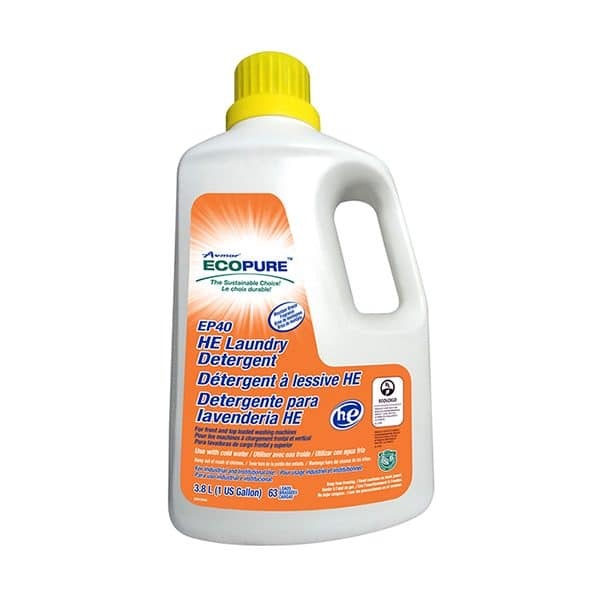 EP40 HE Laundry Detergent is a high efficiency, concentrated, liquid laundry detergent with controlled suds leaving your clothes and washer clean. EP40 is designed to clean up the toughest stains and is safe on all washable fabrics, including wool and all delicates. EP40 contains water additives for hard water situations and works extremely well in cold water. EP40 is effective in both HE and standard washing machines. Fresh mountain breeze fragrance. - No Alkyl Phenol Ethoxylates. - Ingredients in this product are readily biodegradable in accordance with OECD 301 standard. Test inside seam for colourfastness. Check garment care label for special instructions. Separate light from dark colours. For regular loads, pour 60 ml (fill cap to line 2) of EP40 HE Laundry Detergent directly into the washer. For larger loads or heavily soiled loads, pour 85 ml (fill cap to line 3) of EP40 HE Laundry Detergent. PRE-TREAT: Pour and rub EP40 directly onto the stain.